It kind of tickles me that when giving a beta key to a long time subscriber, Blizzard had no idea that said subscriber was also a nut job blogger who’s enamored by poop quests. One of my top priorities has been searching for the Warlords poop quest. Can it be? 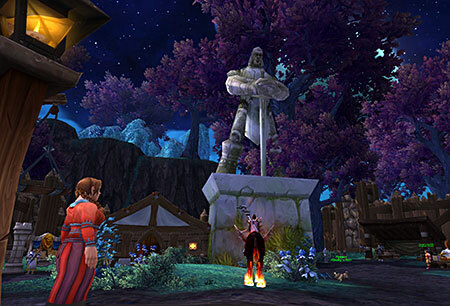 Has the poop quest been elevated to the lofty status of an achievement? And yes, I tried but they haven’t hooked up the plumbing quite yet I guess. OMG! Quick! Someone get a shovel! There’s raid tier buried here! Probably find lots of stuff for transmogging. I wonder if that little dog Pippers did this. Cim! I told you not to muck about with stuff! You messed around with that monument thingy and now we’re stuck with … what is it anyway? The Largest Bowling Trophy Evar … I see. Can you please just not touch stuff if you don’t know what it does from now on? It’s so embarrassing, I know Cim’s a Warlock but look at the way she treats her followers! It’s shocking! I wouldn’t be surprised if they walked off the job on her. Really Cim! Yeah, guess I’d better get back finding that poop quest. Inquiring minds want to know! Oh, okay … maybe you don’t but I sure do. 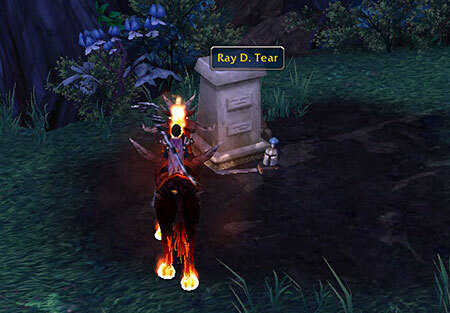 This entry was posted on July 2, 2014 at 10:21 am and is filed under General WoW with tags Ray D. Tear, Staying Regular Achievement, Warlords of Draenor beta, World of Warcraft, wow. You can follow any responses to this entry through the RSS 2.0 feed. You can leave a response, or trackback from your own site. Oh god, I’m sooo thick sometimes!! I saw that grave .. I inspected it, I walked around it, I clicked on it .. I zoomed in on it. I’ve only just now realised what it says!!! Do’h! And I went into the lavvie, but I didn’t get an achievement 😦 Didn’t even get any toilet paper .. or a leaf. *sigh*. I didn’t get it at first but then I remembered something Navi said and I said it out loud and THEN I got it, lol. I know! One of those lazy camp followers need to stock up on necessities like toilet paper for that outhouse! LOL, I’ve been wanting to see the outhouse just so I could get the achievement. Sigh, still no missions, dog, cat or dunny. I’m wondering if the only poop reference is that bit in the starting area. Cim sat in there with a magazine but alas no achievement. It might be but I’m still hoping for a good poop quest to add to the list. I think I love all of you. Thank you! We will never give up our search for the poop quest! I know, it wouldn’t be WoW without one! So far two outhouse related things but no quest. I will press on!